What's the most unusual or rarest guns you guys have? Anything completely random that you've never seen anyone else with? Please post pics to make my night shift more interesting! Or if this kind of thread has been done before (I couldn't find anything in the search) please post a link if you've got it. 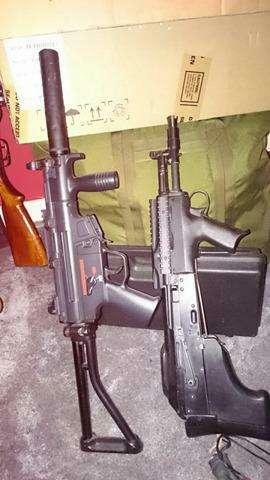 I have a CYMA CM.041PDW (MP5PDW) - I've never seen anyone else with this gun, or any mp5 pdw for that matter. I apparently tend to be lured towards unusual guns. I don't often see anyone with any of mine. JG G3A3 - seen two ever I think. CYMA Dragunov, wood kit and PSO - never seen another (loads of A&Ks, never a wood fitted AEG version). LCT SR-3M - apparently quite popular but I've never seen another outside of the internet. G&G M14 Veteren - seen loads of M14s in polymer, but never another wood kit one. ASG Sten MKII - Never seen anyone else with one, but I imagine they're pretty popular at WW2 games. If i only had the time and money!!! Watch me sell everything I own then mutilate something to the point of unmatchable uniqueness Thompson DMR project anyone? Barrett M82 pistol? All of my long guns are uniquely custom built by me. I like to mod them to my exact needs. I was round my old housemate's place for the first time in a while the other day. I'd forgotten how many guns he has, amongst them, an original Shrike M4 LMG and a bullpup AK. I can't remember where the bullpup AK kit came form or who made it, but I remember them being rare about 10 years ago, don't think I've ever seen another. I would have to pitch a vote to the LCT PP-19-01 and LCT SR-3. 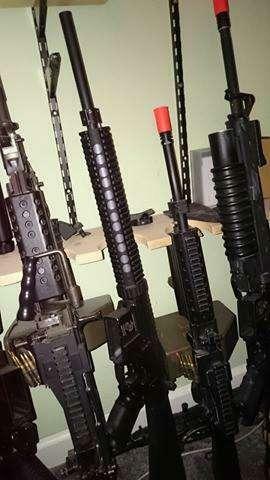 I've never seen those in play, most people tend to have AKs or something that takes STANAG magazines. I do have to also pitch a vote to the Hephaestus HTS-14. I don't think anyone will ever really see that gun in action! Hows this for unusual? I don't have one.